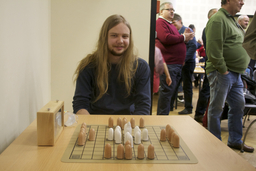 HNEFATAFL-Premiere on international tournament of standard chess. 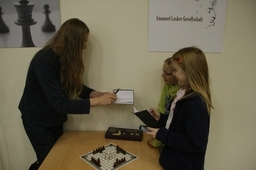 HNEFATAFL - the big sensation at international ladies tournament at Berlin. By René Gralla, Hamburg (Germany). That has been a premiere in the long history of HNEFATAFL: The ancient chess of the Vikings has been part of the accompanying program of an international tournament of standard chess. Norway's WIM Silje Bjerke played a spectacular exhibition game of HNEFATAFL against the CEO of the German daily "neues deutschland" (abbr. 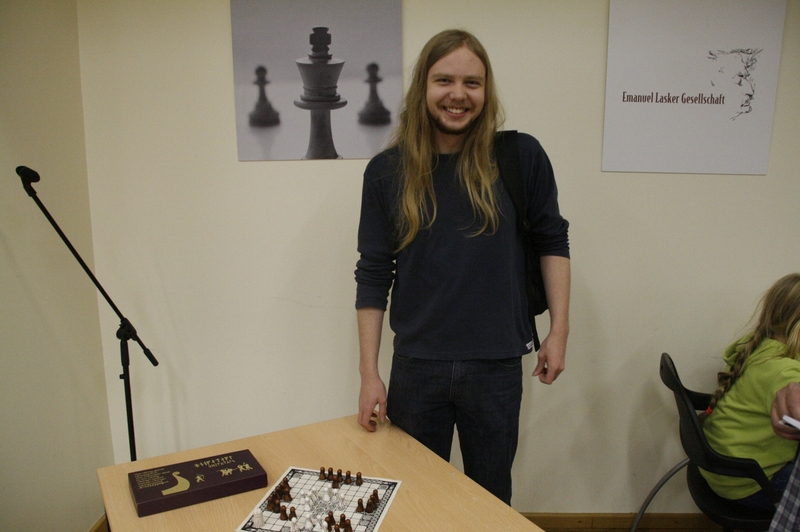 : "nd"), Mr. Olaf Koppe, during the "8th 'nd'-Ladies Chess Gala" on November 28th, 2013, at Berlin. The historic duel that had been integrated into the timetable of the tournament because of the initiative of German journalist René Gralla took place during the break between the three preliminary rounds and the finals of that annual contest of rapid chess that is organized by the Berlin-based paper "neues deutschland", translation: "New Germany", since 2006. The showdown between 31-years-old Silje Bjerke who actually studies gender science at Oslo University and "nd"-boss Olaf Koppe attracted many spectators. Some people even climbed chairs and tables in order to have a better look at the battle that saw the Norwegian Amazon smartly outmaneuvering her opponent. "Silje Bjerke has demonstrated some interesting ideas", said one of the bystanders approvingly, a young man with long hair who might just have ridden in on his own drake. The 19-years-old Arne Roland knew what he was talking about: the student of math is - by fighting under his dreaded nick "Nath" - the reigning World Champion of HNEFATAFL-online 2013 after having prevailed over 12 opponents on the well-known platform http://aagenielsen.dk. 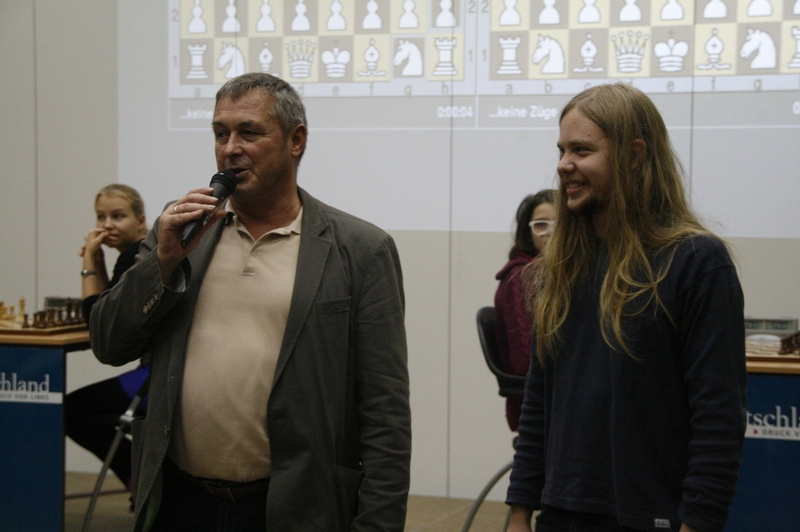 Now there are plans to organize a tournament of HNEFATAFL at Berlin in 2014. Online-World Champion Arne "Nath" Roland has already discussed that project with the CEO of "neues deutschland", Mr. Olaf Koppe. 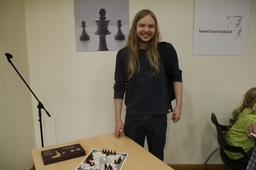 And there will probably one more prominent participant: Norwegian Professor Kjetil Jakobsen who lectures on Scandinavian studies at Humboldt University Berlin was totally intrigued by HNEFATAFL so that he spontaneously played a series of casual games against Online-World Cahmpion Arne "Nath" Roland - end even scored once! The Number One in the Web live at the "8th International Ladies Chess Gala 2013" at Berlin - Arne "Nath" Roland, 19, the reigning Online-World Champion of HNEFATAFL. 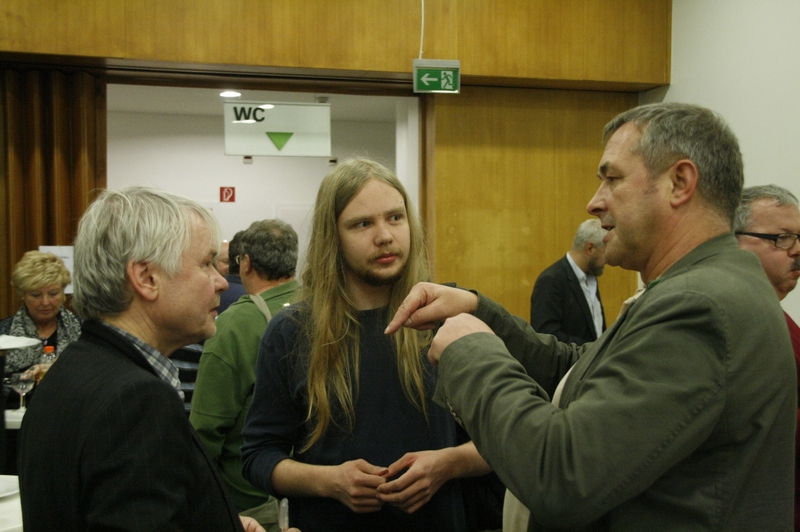 Reigning Online-World Champion of HNEFATAFL Arne "Nath" Roland (left) plays a casual game against Norwegian Professor Kjetil Jakobsen (right) who actually lectures on Scandinavian Studies at Humboldt University Berlin. Norway's WIM Silje Bjerke faces the CEO of the German daily "neues deutschland", Mr. Olaf Koppe, during an exhibition game that was one if the highlights of the "8th International Ladies Chess Gala 2013" that has been organized by the Berlin-based paper "neues deutschland", translation: "New Germany". Getting prepared for their exhibition game: Norway's WIM Silje Bjerke and Mr. Olaf Koppe, CEO of the German daily "neues deutschland", try to figure out the tricks and traps of HNEFATAFL during a warm-up game before their great showdown. The future of HNEFATAFL looks bright: Online-World Champion Arne "Nath" Roland at the "8th International Ladies Chess Gala" at Berlin. Discussing new projects of HNEFATAFL: Online-World Champion Arne "Nath" Roland (center) with CEO of the German daily "neues deutschland", Mr. Olaf Koppe (right), and the German journalist René Gralla (left) who has been the initiator of the historic exhibition game of HNEFATAFL during the "8th International Ladies Chess Gala" at Berlin. A great welcome for the hero: Mr. Olaf Koppe (left), CEO of the German daily "neues deutschland" and host of the "8th International Ladies Chess Gala" (that has been won by Russian Women Champion Valentina Gunina who is seated at the table left on the stage in the background), says welcome to the Online-World Champion of HNEFATAFL, the 19-years-old Arne "Nath" Roland from Berlin. 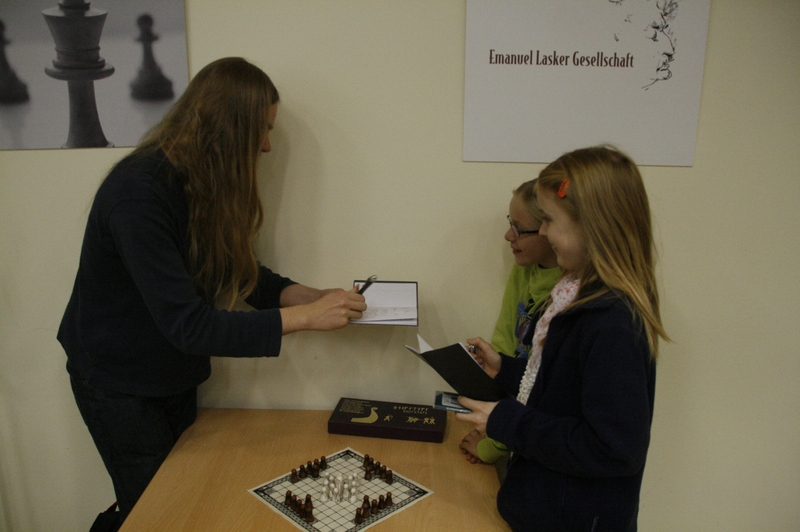 The Online-World Champion of HNEFATAFL and fans: Arne "Nath" Roland signs autographs. A real crowd puller during the "8th International Ladies Chess Gala" at Berlin: the exhibition game of HNEFATAFL that was battled out between Norway's WIM Silje Bjerke (seated in the foreground with back to the camera) and Mr. Olaf Koppe, CEO of the German daily "neues deutschland" that was host of the event. Under the watchful eyes of referee Arne "Nath" Roland (with long hair - standing right beside Mr. Olaf Koppe), the reigning Online-World Champion of HNEFATAFL.